I like those. I didn’t note what Epic adjustments could be done but I should do so. The unarmed Monk can hardly use most of the destinies don’t support improving unarmed damage. Henshin needs A LOT more than just simple attack speed. Henshin is not a thief acrobat, and doesn’t need to be a clone of the thief acrobat. Thus, it needs to go a different direction, like how arcane archer is from deepwood, or how eldritch knight is from, say, archmage. Henshin is a supportive hybrid tree, not meant to be a one-trick pony with quarterstaves, but meant to deal both physical and magical damage in equal amounts. Your assessments of Henshin are way off the path to what it needs to be. For all your concerns over monks, you elaborate on shintao and merely scoff at henshin mystic, which, as it stands now, is the worst tree in the game both in damage and execution. Disagree. The Mystic’s overall versatility offensively is there. Now that handwraps and many other ki weapons with spell power effects drop regularly, a Mystic could try other attack options. But its tree is built for staves. The tree could use a few more spell power options, but these can be compensated by racial or Harper trees. I never had problems offensively with the Mystic, but surviving with one, since it can generate far more aggro than any Shintao, is the tree’s most problematic deficiency. Attack speed would help, but a Mystic should have far stronger defenses than it has, which is why Epic play with the tree is too difficult right now. I can generate far more damage in both physical and magical sides with a stock Mystic–and you pay the price when your AoE effects cause all to charge you. The general plan of the tree is fine and balanced offensely; the defense is non-existent. I completely disagree. There’s a reason you don’t see more henshin mystics in the game. – Unreliable DC’s for ki abilities: you can’t utilize spell focus feats or items. Spellcasters that do have access to these things often have trouble in elite quests landing damaging spells on mobs with evasion or high reflexes. For all their DC capabilities, if a wizard, sorcerer, or spellsinger has a bit of trouble doing it, the henshin doesn’t stand a chance. – Half the tree is pointless and worthless in meaningful content if all you do is swing a quarterstaff, and if that is what you’re doing, then thief acrobat is ten times better in every way. – Ki damage doesn’t matter for 75% of the game’s content. If you do manage to hit an enemy with your ki attacks, the damage is still going to be low due to the lack of metamagic use. Also, what ki damaging abilities you do have are situational, slow to use, expensive, and have limited use. – Paladin syndrome; too many stats for too many things. You’re essentially going to be in melee for 70% of your time as a henshin, so you can’t dump con. Dex, int, and cha can be dumped or pumped as needed. The main issue is if you pump strength, your wisdom is lacking, meaning your ki DC’s will plummet into worthless territory. If you pump wisdom, your dps will suffer because of lower strength, and your ki DC’s still won’t be worthy of any use in any remotely end-game content. So, you can pump str and dump wis and have average damage and worthless ki damage, or pump wis and dump str and have low damage and low ki damage. There’s a no-win situation, here. A wisdom-to-attack/damage mod for quarterstaves would alleviate any issue on this front and open up interesting multiclass options with druids, clerics, and fvs. – Poor execution. Henshin is a classic example of something that looks good on paper but fails miserably when you get down to it. 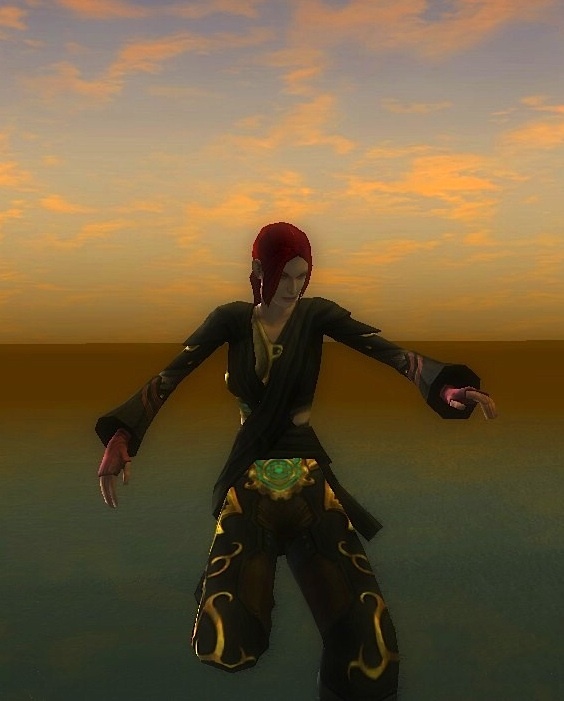 You have two abilities that require you to stand still and do nothing, something which is very much frowned upon in DDO’s fast-paced environment, and the abilities themselves harm your damage output rather than boost it. You have 8 AP worth of useless elemental word abilities nobody in their right mind would ever use because they do nothing for you. While not one of the more expensive trees, everything in the tree except for two things costs 2 AP per rank, making it annoying to level and more often than not, you don’t get the bang for the buck. This tree almost looks like it was an afterthought, and poorly designed. I agree on Elemental Words (a legacy formerly in Ninja Spy that isn’t too effective). Nor is it worth training to get the ill-placed Void Strike. But it’s also clear that you have an entirely different play style. My Mystic had very good WIS and STR, but from there, it couldn’t have high CON, essential for all the aggro it generated. I killed effectively, just not fast enough. I use ki a LOT for augmenting my damage on every Monk. Far too many players equate “ki is Monk spell points” and they fail when they don’t strategize how to use it. STR is the main stat for damage, like Shintao. I see far larger crits on Mystics for this reason. That said–cut the devs some slack. The Mystic didn’t EXIST before the enhancement pass, nor did most of the changes that make Ninja Spy far more versatile before the new trees. I’m confident that many of the ills of the tree are going to be addressed. I won’t address multiclassing, but I don’t discourage it, either. It’s not my thing and I let others far more experienced than I to ponder those options. Monks are all about balance–but the Mystic is clearly unbalanced in certain areas. 1) They require a small portion of provisions and support, as the majority of their support is internal and provided by nature. This means standard battlefield tactics don’t work against them. 2) They hit harder than any complex noun known to man has ever been capable of. A recent study of the Shaolin monk found that they can punch with the force of a small automobile crashing into something at 55MPH, concentrated into the size of a fist. They can do this extremely quickly, some monks punching as often as six times per second with freakish force. 3) They are more difficult to injure than any known non-monk human being, even in full plate armor. The Shaolin art of “Iron Skin” shows just how sturdy the Monk is by disallowing a razor-sharp spear from puncturing a fellow’s gut in one video with two monks demonstrating it. Essentially, a Monk is to be the most fearsome and dangerous combatant and needs nearly no support. In DDO they would be “The ultimate fighter.” They rightly should put Fighters and Barbs and anyone else that uses weapons to shame. Sadly, we have the issue of balance demons crawling all over the forums and defecating on and in our beloved game regularly. The only reason Monks haven’t won any wars is because to a Monk, war is an abomination and should never be allowed to exist. The only way to win a war in a Monk’s eyes is to never let it happen in the first place, and they act accordingly. Now, introduce magic to these introspective geniuses and you have yourself nearly deific beings that can focus so intensely on magic that they literally become magical beings and gain strong psionic abilities. I doubt the devs at DDO understand what a Monk actually is. I was cool on everything you said except the very last sentence. The devs understand. But they are also attempting to keep the class interesting. But you can go too far and corrupt the essence of the class. I play Monks because of that very resilience and self sufficiency you note. I’d just like some attack variation and a lot of Mystic fixing. I agree with the Teacher about the idea of having the Shintao tree be more versatile. My Shintao is never in the earth stance, as I prefer Fire or Ocean (fire mainly, but Ocean if I need the extra boost to my quivering palm). I do not agree about the idea that the only stat to main is STR, however. I am able to keep up with most fighters or other main killing machines as a WIS/DEX build with weapon’s finesse. I fight unarmed, but can still usually tank in most epic content with the right destiny (Sentinel puts me at about 1300 hp, and my healing ki heals me for about 300-400). I do wish we had void strike back, though I would say add it as a monk feat, similar to empty body or abundant step. I would say give it at level 12 or 15. also, curse of the void dragon needs to add more uses of meditation, say 1 every 2-3 monk levels. otherwise this almost useful enhancement just isn’t worth it, as you need to put several points into mystic to gain the extra uses, and only end up with 5. Thanks for that clarification. While the Shintao enhancements favor Earth stance, you don’t have to always use it–but you may miss out on enhancements that only work in that stance. Syncletica, my first Shintao, is a Wind stancer. Excellent speed but now gets eaten up because Shintao’s best defenses are less effective. Turn on Meditation of War before L20 and it’s downright painful. I wish that Shintao would be more beneficial to all stances. That said, Grandmaster of Flowers doesn’t make non-Earth stance use a cakewalk, either. Unlike when I had Vlad on my Ninja Spy fist/sword combo, I have to actively think about sources of healing. I’ll sneak through as much as I can, but I’ve noticed that without a good stun option I’m “tanking and spanking” more like my barbarian-alt than I ever did in Vlad’s first life. Of course I have all of my miss chances maxed out as high as I can, and I’m constantly cycling various debuffs (Unbalancing Strike to activate my sneak attack, Flash Bang to blind/stun, Wave of Despair on Touch of Despair finishers when I can’t turn my foes into charcoal with my fire attacks, knockdown on Adrenaline attacks, paralyze via finishers, Shadows Can’t Exist Without the Dawn for some serious healing in mid combat –about 280 with healing advancements–, etc) to screw with the enemy (and making sure I drop an All-Consuming Flame on bosses as I stand my ground in a Cauldron of Flame, 10% adds up in that inferno of death), but I do find myself needing a healer NPC more often than not. Pots of Haste have become a must depending on the boss. Thankfully Ki regen isn’t the problem that it used to be as I approached level 20, but even with Earth Stance it can be rough (and the Way of the Sun fire stance healing is really nice depending on the adventure). When I crit, I hit like a ton of bricks. It’s even more beautiful when I crit using Adrenaline, I easily hit four digit damage with a staff and take a noticeable hunk out of most bosses hp bar (about 1300 damage). That’s nothing to sneeze about, but that’s only possible with an almost maxed out destiny and doesn’t represent normal play with a henshin. I’m still getting used to the new equipment released in the last few patches, but I haven’t seen too much that really benefits a henshin. Gear requirements are a bit screwy for a enhancement tree that uses both spell-power and still need to beat things to death that you can’t avoid via sneaking; I’ve very much seen a need to try and balance my bonus fire damage and melee attacks (which can be tough but not impossible). If anything henshin reminds me of playing my dark knight in FF11 (way back in the day) where I’m constantly balancing my attacks between spells while trying not to bite off too much at the same time. You don’t get as much “bang” upfront like you do from being a caster, but casters don’t often crit with a staff and deal triple digit damage (around 300) in epic very often. The only downside is if it doesn’t burn then i’m far less effective against the mob, but not as bad as I feared while leveling up. What I’d like to see are the various Elemental Word Curses being more useful in combat, I’ll be honest that I’ve MAYBE used the cold version against certain fire-critters just to drop em faster, but I can honestly say that I’ve never used the acid or electric versions. I’ve given up on Embracing the Void (too expensive for 2 AP apiece) as nearly useless in combat, and Negotiator does the exact opposite of what I need to do in combat (I need the mobs to come into my circle of death, not away from it). Some melee attack speed with a a staff would be fantastic (I’m looking forward to the Haste feat when I reach a high enough level) and not having the Ki penalty to Lighting the Candle would be appreciated. Great observations on the Mystic and ninja that match up to my use, although you’ve clearly made some superior adjustments. Thanks! 1) Scale back slightly on both Str and Wis so I can add a bit more Constitution, would be welcome in this kind of build. I’m floating at a very healthy HP in the lower 500s with 2 levels of epic and almost maxing out my destiny currently, but standing still and taking the beating has made me nervous far more than I’d like to admit. 2) Not even bothering taking Stunning Blow, I’m sure that I could have taken something more useful as I leveled up with how infrequently it lands (even with my spiffy new random loot staff with a huge stunning bonus). The stunning math is just against me. 3) Begin stockpiling Haste pots, I’ll need em. 4) Focus more on Ninja enchancements at lower levels to get a lot of the spiffy survival toys and skills, and less in Henshin until I start approaching level 10. Henshin just doesn’t add much until you get into higher levels anyways. Mystic almost is an “all or nothing” tree at times. 5) Not wasting my time trying to lower hate from enemies: I need to crank it up to 500% when I need to clear a room.Instead of using a scalpel for surgery like I would with a Ninja, I have to realize that I’m doing the same surgery with a clue-by-four studded with nails against the patient and his entire family. 6) And thank the shadows I perfected sneaking around in my first life and how to leverage all of the miss chances that I can get: It matters since I’m acting a bit like a barbarian without the heavier armors. Anyways, thanks for the great blog, I know many of us appreciate it! Trackback: DDOCast 425 – Building Bards « DDOcast – A DDO Podcast! I had an observation that I’d like to ask other Mystic players if they’ve run into: when I’ve been playing around in epic content I’ve noticed that I always have far more ki than I can possibly use in combat. I’m not just swinging away with my staff and failing to use my monk special abilities, I just produce it faster in both Earth and Fire stances that I can possibly use even against bosses. Does anyone else experience this or is this just unique to my play style? If this isn’t a unique experience, could chunk of the solution to some of the “quirkiness” of the mystic enhancements be in letting mystics pump more ki into our ki strikes and finishing moves for bigger attacks? Or, allow them to use ki to boost defenses, attack or even speed. It would be like the Spirit Charges that Primal Avatars can build up to activate abilities. Nice idea. You should send that to the devs! To be honest I wouldn’t know where to begin with submitting that idea to the Devs, but I do like the idea of boosting defense, attack, or even speed as well like the Primal Avatar’s Spirit Charges. I guess it’s research time when I get off work.